We have all been there: you get up to the register at a store in your local mall, purchase in hand, and the associate begins ringing things up, but then they pause. Now you’re presented with a choice. At first glance, it seems a pretty simple one to make. After all, you are buying something anyway, and now you can get it for less. But, slow down a moment and consider what you are actually doing. You are applying for a brand new credit card and have not even had a chance to consider what impact it will have on your credit score, whether or not it has a competitive interest rate, or if there are any sort of hidden fees… In short, you are being asked to buy more money on impulse. Let us take some time now to consider all the angles of retail store credit cards so you can make a wise, educated decision the next time this situation presents itself. 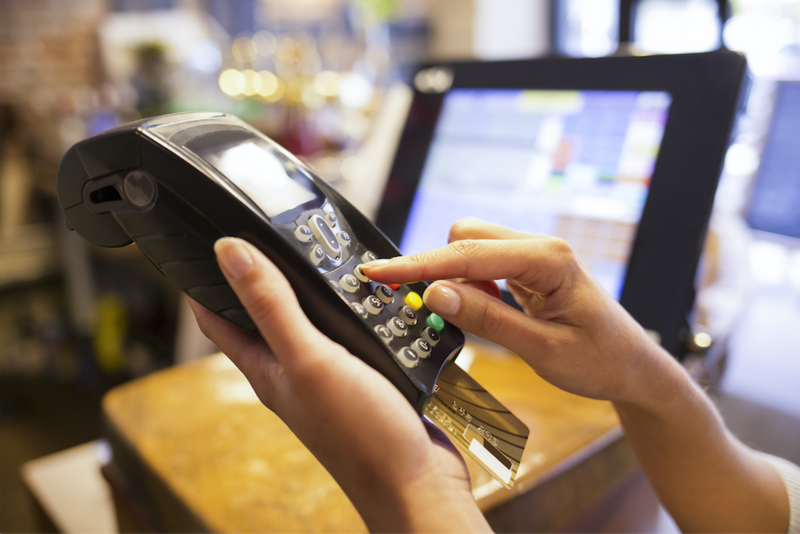 What are retail store credit cards, and how are they different from “normal” credit cards? Retail store credit cards are the cards nearly every retail store makes available to customers. They function like any other credit card, but can only be used for purchases at that store or (in some cases) on the store’s website. As such, retail store credit cards are no different from any other type of credit card in how they are used or what impact they can have on your credit score. Every application and “20-second approval” requires a hard inquiry that will drop your credit score a little bit. If you apply for several store credit cards over a short period of time, the overall impact could be significant. It also means that every retail store credit account in your name increases your total available credit, and every balance you maintain on those cards counts toward your total debt. So, when the bureaus are figuring your credit score (or lenders are considering your loan application) retail credit cards count into the important credit utilization ratio. Likewise, your payment history and timeliness on every retail store credit account — even that little $300 limit card for the hole-in-the-wall shoe shop in the mall — counts either positively or negatively toward your credit score and history. Why do retail store credit cards exist? You may wonder, since I can use my “normal” Visa or MasterCard at all of these stores, why do retail store credit cards even exist? The answer is simple: retail store credit cards encourage you to shop more often and/or spend more at the issuing store. At the same time, they offer the store contact and demographic information about you and your buying habits they might otherwise not be able to collect, which aids them in their marketing efforts. That is not to say these cards cannot benefit the consumer in some way as well, but it is important to understand that benefits relating to the customer are not the main reason behind a store’s provision of a store-specific credit card. What are the advantages of obtaining a retail store credit card? Sign-up discounts – Nearly every retail store credit card includes some sort of instant discount or bonus for signing up, often applicable to the purchase you’re making right now. Everything else being equal, this is essentially free money, so it can be a positive thing. Ongoing discounts – Many store cards also offer additional discounts related to using the card. These may be related to individual products, seasonal specials, or may be a flat discount off every purchase made using the card. Special offers or perks – Some retail store credit cards offer additional perks as well, such as exclusive offers reserved just for cardmembers, or accumulation of reward points for use toward future purchases. In rare cases, these perks may even be made available toward purchases or rewards outside the store itself. Spending flexibility – Having a credit card available for use at a given store can allow greater flexibility to make purchases when the price is best or when you most need the item, rather than waiting until you have the cash handy. Interest-free financing – In many cases, store credit cards will offer interest-free (0%) financing for a limited time and/or toward purchases over a certain dollar amount. Establishes a credit history – Retail store credit cards are much easier to qualify for if you have little or no credit history, or if you’re working on fixing your credit after a bankruptcy or similar situation. Credit consultant Julie Marie McDonough, author of “How to Make Your Credit Score Soar,” calls retail cards the “training wheels” of credit. Builds a credit history – Used wisely over time, store credit cards can boost your credit score and build a positive credit history just like any other credit card or loan. However, since they are easier to qualify for, they may be the best or only choice for some consumers in need of credit repair. What are the disadvantages of opening a store credit card account? Expensive fees – The more accounts you maintain, the easier it is to miss a due date, even if the money is there. While they are common with most credit accounts, late fees on store cards are particularly steep. Target, for example, charges a $27 late payment fee the first time you pay late, and then increases the late fee to $38 for each month you miss payments up to six months. This is a direct result of the lender’s easier and faster approval process. They are taking on extra risk by approving less reliable debtors, so they make up for that risk with higher late payment fees. Non-transparent rules – The standard sales pitch described at the outset lends itself to pressuring the consumer into applying without providing much, if any, of the fine print. Unfortunately, some retail store credit accounts include rules and limitations in the fine print that would have likely resulted in a different decision if the consumer had known. Next time the associate asks you to apply for a store credit card, should you do it? Of course, the answer is, “it depends.” The two most important factors in the decision are your own spending habits and the specific details of the account you’re considering. If you are already a regular customer at the store and make purchases there regularly, then there’s a good chance the discounts and perks that come with a store credit card could save you money over time. Likewise, if you haven’t applied for credit recently, and have no intention of doing so again in the near future, the tiny impact on your score from applying for one account shouldn’t dissuade you. On the other hand, if having that card in your pocket is likely to cause you to overspend or buy things you otherwise would not have considered, just say “no!” If you’re planning to apply for an important loan or to request a credit limit increase on an existing card, there is no sense in jeopardizing that approval for the sake of a 10 percent discount on your current purchase. As with any sort of credit, it’s vital to remember that credit cards can and should be a powerful tool to help improve your financial situation. But, that’s not why they’re offered to you. It’s up to every consumer to make the best decision about whether or not to apply for and use a given credit card to their own benefit. For more advice, check out these past articles on wise use of credit and how to boost your credit score. This entry was posted in Credit Cards and tagged credit card, Credit Score, interest. Bookmark the permalink.